There‘s no doubt the fuss over the eligibility threshold for election to the World Golf Hall of Fame caused the Board of Directors to revamp the criteria. In essence they saw, as did many, election to the HoF had lost some of the specialness which should be reserved for truly outstanding players. The Hall had become a recognition not for play in the Hogan-Nelson-Palmer-Nicklaus-Player category but for something less and golf fans seemed to respond with a collective yawn. The special cache that goes with induction into the Halls of other sports was missing. 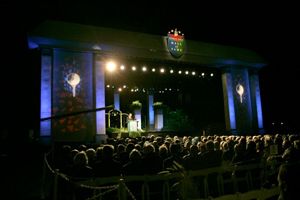 Even those who had been enshrined did not come to subsequent ceremonies in spite of the date being moved to the same week at the Players Championship played nearby at TPC Sawgrass. The announ cement of the revamped eligibility rules focused on what it will take for men to be considered. Rather than 10 victories a potential candidate will need 15 wins on one of the recognized international tours or two majors or Players Championships to be considered by the Selection Subcommittee and passed along to the 16-member Selection Commission. Twelve of the 16 must concur instead of what had become a declining percentage under the old procedure. The lowering of the standards for admission to the Hall was undoubtedly a reflection of what can only be called the HoF’s massive “loss in focus.” Originally set at 75 percent to receive enshrinement, the percentage was first changed to 65 percent. Then, and this borders on the incredible reflecting I’m sure the evident panic that there might not be anyone who received the requisite votes, the bar was lowered to the candidate receiving the most votes over 50 percent. Rather than an elevation to Mt. Olympus the Hall of Fame had become mor e a recognition of good players who were popular. Also interesting are the comments coming from media members who formerly were part of the 300 or so people (including members of the Hall) who received ballots under the old system. Some have written that they the people who write about golf should retain a major part of the process presumably because they are better judges of what constitutes golfing greatness. It‘s also obvious the HoF Board is serious in getting acceptance from fans and they pulled out all the stops setting up the first Selection Commission to scrutinize potential inductees for the next Class in 2015. It will be headed up by four of the most popular members of the Hall: Nancy Lopez, Arnold Palmer, Gary Player and Annika Sorenstam. Stepping back to look at the records of recent modern era inductees we find in the Class of 2012 Fred Couples (15 PGA Tour victories – 1 major – 1 Players – 5 international victories), Colin Montgomery (0 PGA Tour victories – 0 majors – 0 Players – 36 international victories) and Ken Venturi (14 PGA Tour victories – 1 major – 0 Players). In the Class of 2011 there were Sandy Lyle (6 PGA Tour victories – 2 majors – 0 Players – 18 European Tour victories) and Phil Mickelson (42 PGA Tour victories – 5 majors – 1 Players – 4 international victories). Is there any argument the system required the changes? We support the World Golf Hall of Fame in their efforts to bring the Hall and its members to the attention of fans and make it a must-visit for every golfer. And besides, if I understand the criteria correctly, Andy North with three career wins, the Westchester Classic and two U.S. Opens, is now a shoo-in. 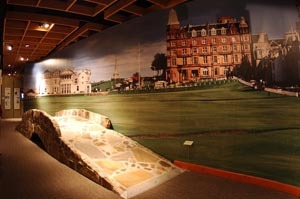 Images courtesy of World Golf Hall of Fame. 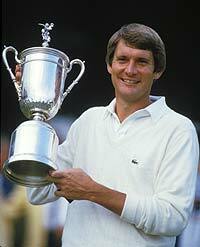 Andy North’s image courtesy of the USGA.